Sylvester situates his subjects within fabricated environments that recast seemingly mundane spaces as hyper-real and manufactured scenes, loaded with narrative intent. He often embeds direct citations to recognisable brands or corporate logos within these simulated settings. This conflation of manufactured realities and commercial branding stems from Sylvester’s interest in the way brand identities cultivate, as he phrased it in 2014, ‘a concentrated world, a considered, complete world’. 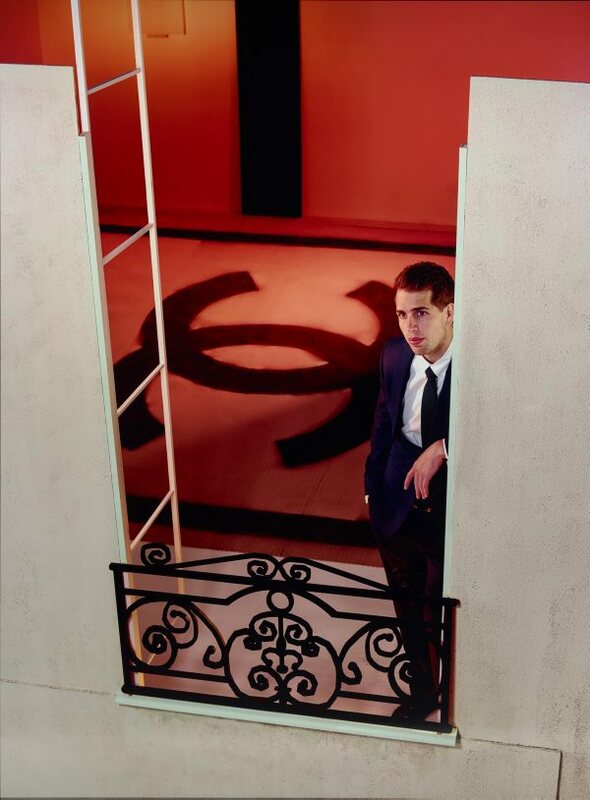 In ‘Dreams end with you’, the interlocked C’s of the Chanel logo punctuate the photograph’s mise-en-scene. A man stands by the window of a Chanel store, staring into space. Sylvester did not model the scene on a real store, but on the backdrop for the label’s 2009 spring runway show (which he attended) that recreated Coco Chanel’s apartment, a site that serves as the template for all new Chanel stores. It is, in Sylvester’s own words, ‘a copy of a copy. A dream from a dream’. The image dramatises its simulacral status. Unlike the manufactured spaces in Sylvester’s earlier work, this set is not pristine. It does not disguise its fabrication but exposes traces of rudimentary construction. Here, the superficial fantasy of the heavily branded world is partially undone. Bathed in the synthetic orange glow of the store’s interior, the man is lost in his own reverie. Against this clinical and impersonal backdrop his vacant gaze retains an emotive inflection. As with much of Sylvester’s work, his concern with the surface and the superficial is laced with an interest in divulging the inner thoughts of his contemplative subjects.